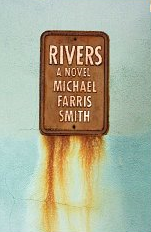 I had the opportunity to read a review copy of Rivers: A Novel by Michael Ferris Smith. It is a tale about a few remaining stragglers who crossed paths in a world that is constantly battered by never ending storms and hurricanes. The story follows Cohen, who lost his wife and unborn child a few years earlier, as he tries to continue surviving in a devastated area, long after the region was declared unfit for living. The constant misery and greyness of the weather pervaded the entire atmosphere of the book. There is really no explanation of what is caused the violent weather patterns it just is. The idea of having daily storms pounding one area of the country may be a bit hard to accept at first, but as I continued on, I found myself suspending my disbelief and becoming more accepting of the idea. The writing is rich with vivid images and story moves along in a fast pace that the reader quickly becomes caught up in the story. You are not going to pick up any ideas about living through a disaster, but it portrays how people react to life threatening situations and their mental states are depicted quite thoroughly. Many of the characters have done evil things to survive, though they would not inherently consider themselves evil. They “just had to.” The road to hell is indeed paved with good intentions. The story moved along in a good pace, and it was easy to become “immersed” in the story, so to speak. The characters are well written, however I had trouble relating to characters’ choices. In many instances, I did not feel a connection with the characters, and disagreed with many of their actions. In spite of this, I still felt invested enough to find out how they fared. Not wanting to provide any spoilers, I won’t say how the story ends. Though this is a completely different story, there are some parallels to The Road, by Cormac McCarthy, in the struggle to survive and find redemption. All in all, Rivers: The Novel is a highly engrossing book and I liked reading it. I haven’t experienced the devastation of the terrible storms and floods that make the news but I have been through extreme weather. It definitely brings out a side of people that you don’t normally see. The year was 2004, I lived in Florida at the time. If you remember it was the year that Florida was hit with 5 hurricanes. I actually volunteered to help feed some people who worked with my mother and get to see first hand the damage. Something I had never seen firsthand. If you see the damage on t.v. You always think wow. But up close and in person makes a big difference. A few weeks later we got hit with one of the hurricanes. Across the street from the house I was renting was a palm tree about 20 feet tall. The wind would so hard it would bend over and touch the ground ever few minutes. The lights went out and my buddy and I played cards all day by candle light or by the light from outside. We still had water but no power for a few days. We ate all the fridge stuff the first few hours and worked on the dry goods the rest of the week. When the storm ended people just came together to clean the neighborhood. No one from outside the neighborhood came around and bothered anyone. We just watched each other’s houses to make sure nothing happened. And life went back to normal. i’ve been through a couple of hurricanes without severe consequences. however, the worst storm i’ve experienced was a blizzard in 1966 when my family was living at grand forks air force base in north dakota. weather predictions weren’t as exact then, so we had very strict regulations about keeping food and water stockpiled at home and emergency kits in cars. we had plenty of supplies for the 5 of us, but then we got some unexpected guests. some houses on base lost power and their residents were assigned to stay with other families for the duration. we were assigned a woman whose husband was trapped in one of the missile silos. they had 3 young kids and a 2-week-old baby (thank god she was breastfeeding!). the blizzard was well underway by then, so my father and some other men strung ropes between our house and the refugees’ house–about 2 blocks away–so they wouldn’t get lost. they had to make several trips to get everyone across. i remember watching out the window as the men carried the infant toward our house (well-bundled and in a cardboard box), holding tightly to the ropes and struggling to stay upright in the raging wind. the temperature went down to 75 below at some point, and that was before wind-chill factors were invented! anyway, we all made it through, although on the last day we were down to some pinto beans, and i think a little dry milk. when the weather cleared, some of us went out with a little red wagon to get supplies. we didn’t go to school for about 2 weeks, because the buses couldn’t get through; it took a while to clear the 20-foot snow drifts that blocked the street! my best friend’s house faced north, so they were among the many who had to dig a tunnel out from their front door; but until they finished the tunnel, they got out the easy way–by going upstairs and climbing out a window, then just sliding down the drift to the street! Hi teabag, That is quite a story, having to take in people, and trapped people getting rescued, not to mention being snowed in by the blizzard. I am sure going through that at a young age would convince someone to be a prepper for life! Thanks for sharing that remarkable experience. actually, that blizzard (i was 12) didn’t do it; i didn’t come out of denial until i saw what happened to those people in new orleans after katrina! but maybe that and other childhood experiences have helped me evolve as a prepper since then. you never know.